He was also the architect in publishing Ma'ariful Qur'an which is the translation of the Qur'an al-kareem into Urdu by Muhaddith al-Azam al-Hind Rehmatullahi alaih. This translation was published along with notes in Gujrati and Hindi languages. He has written numerous Naats. When he first started writing naats he sent some of his work for perusal to the Indian poet Shafiq Jaonpuri who after reading his work replied that "poetry this complete and comprehensive does not require rectification or amendment." He writes poetry under the pseudonym of Akhtar and a compilation of his work was made and published in the sub-continent titled 'Guldasta '. His first visit to perform hajj took place in 1973 with his mother, wife, sister, younger brother Ghazi al-Millat Sayyad Muhammad Hashmi Miya Ashrafi al-Jilani, and nephew Sayyad Jahangir Ashraf. He has also visited the Al-Aqsa Mosque in Jerusalem as well as shrines of the Ahl al Bayt, Sahaba-al-Kiram, Sufiya al-Kiram, Awliya Allah in Iraq, Jordan, Palestine, Syria, Pakistan and India and throughout the Middle East & Asia in order to pay his respect and to obtain their blessings.Shaykh al-Islam has recently just completed another Hajj (2004/2005) - one of many. A mureed has written a personal account of his journey to Mecca and Medina. He acquired the title of Shaykh al-Islam circa 1974 when the Ulema of India started addressing him as such. 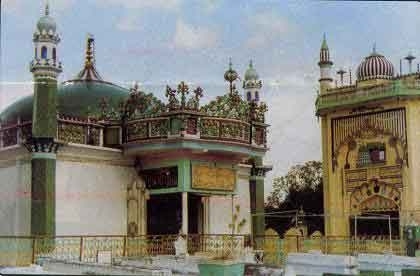 Among the Ulema present at the time were Mufti-e-Azam al-Hind Mawlana Mustapha Raza Khan Rehmatullahi 'ta'ala alaih of Bareilly Shareef son of Ahmad Raza Khan; and Hadrat's Pir-o-Murshid - Shaykh al-Mashaykh, Mawlana Sayyad Mukhtar Ashraf 'Sarkar-e-Kalan' Rehmatullahi alaih. He was first addressed as Raees al-Muhaqiqin by His Holiness 'Gazzali-e-Doaran' Shaykh al-Hadith Mawlana Sayyed Ahmad Saeed Kazmi Rehmatullahi ta'ala alaih of Pakistan after he had sent for his perusal a fatwa on the Islamic use of television & video. Gazzali-e-Doaran Sayyad Ahmad Saeed Kazmi Rehmatullahi ta'ala alaih was so pleased with his ruling and the way that he had dealt with this subject that he addressed him as 'Raees-ul Muhaqiqin'. A letter confirming this was published in the monthly journal 'Al-Ashraf ' in Karachi in 1986.